Today I made my first visit to the new (or rather, half new, half old) Photographer’s Gallery in Ramillies Street W1. Compared to the old exhibition space (and compared to the even older, two detached galleries opposite Leicester Square tube station) the new gallery is fantastic. There are five floors (three of exhibition space) and cafe shop levels. The exhibitions I saw were RAQS Media Collective (An afternoon unregistered on the Richter Scale 2011) and Burtynsky: Oil. The latter had a brilliant display of images showing the mostly unsavoury sides of the oil revolution. Pollution, scrapped ships, aeroplanes, discarded tyre dumps, deserted oilfields and so on. Detail in the images was excellent. 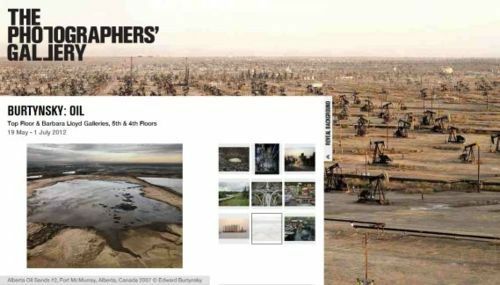 The Photographer’s Gallery website with one of Burtynsky’s images displayed. Many of the photographs have an existential air about them. There is a kind of nausea here. One could be said to feel rather like Antoine Roquentin when one looks at these images. It is easily realised that much of this dependence on oil has resulted in many messy things, and it is clear that problem are not going away to easily. The words used by William V. Spanos to describe Roquentin’s nausea – an “example of “negative capability,” a presentation of the uncertainty and dread of human existence, so strong that the imagination cannot comprehend it,” may well easily apply to Burntynsky’s work too. One could say that there is an existential crisis out there and Burtynsky has used his photographic skills to show us the nightmares out there. And at the same time he has shown us the near futility that exists in the capability of humanity to sort out these problems. Thinking about them to much may well cause pangs of nausea. Burtynsky is clearly one of those few photographers to show us the existential crises of our times. The Photographers Gallery exhibitions are well worth a look, as is a tour around the new gallery facilities. Burntsky is on show until the 1st July 2012.